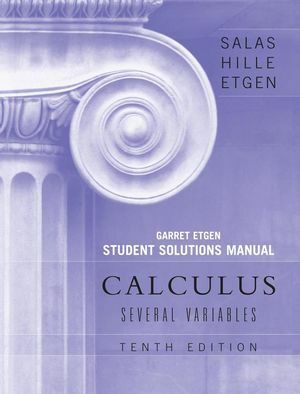 Calculus: One and Several Variables, 10th Edition offers a thorough overview of introductory calculus concepts and application?focusing on comprehension, problem solving, and real-world usage. Readers have turned to Salas for years in order to learn the difficult concepts of calculus. The book consistently provides clear calculus content to help them master these concepts and understand its relevance to the real world. This manual is an excellent tool for providing instant feedback to example problems that may be found on modern calculus exams. Satunino L. Salas is the author of various Wiley calculus textbooks. The Mean-Value Theorem and Applications. Some Applications of the Integral. Sequences; Intermediate Forms; Improper Integrals.